Protruding from the great watery depths of Michigan’s Lake Superior is an island considered sacred for thousands of years. Isle Royale, or “Minong” as the Native Americans referred to it, was held in this regard due to both its spiritual significance and unimaginable mineral resources. The mineral wealth referred to are extremely large copper deposits that are incredibly pure! Thousands of ancient mines dot the landscape of Isle Royale and the neighboring Keweenaw Peninsula. 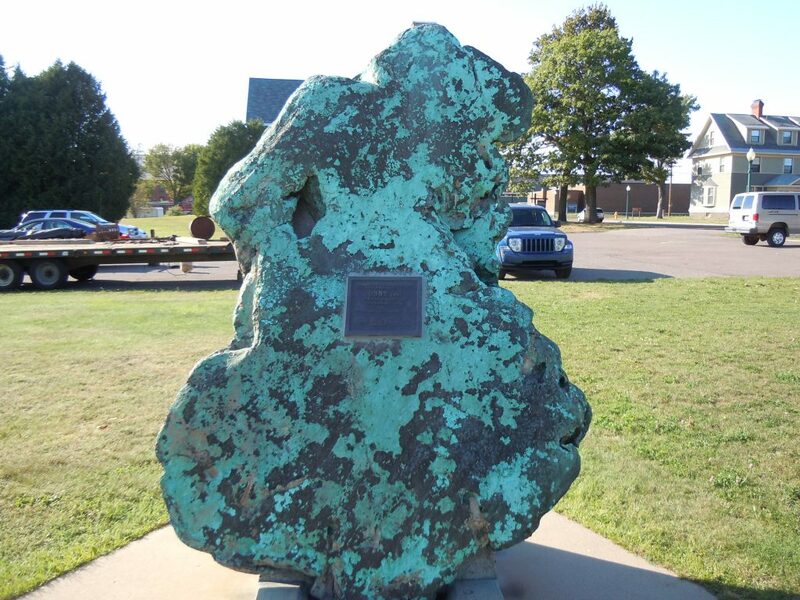 Estimates regarding the amounts of copper mined in ancient times is upwards of a half billion pounds! Lake core samples and carbon dating have placed the ancient mining operations back in time up to 6500 years ago. It was during research into these ancient mines on Isle Royale that lead to the discovery of an enormous underwater anomaly. 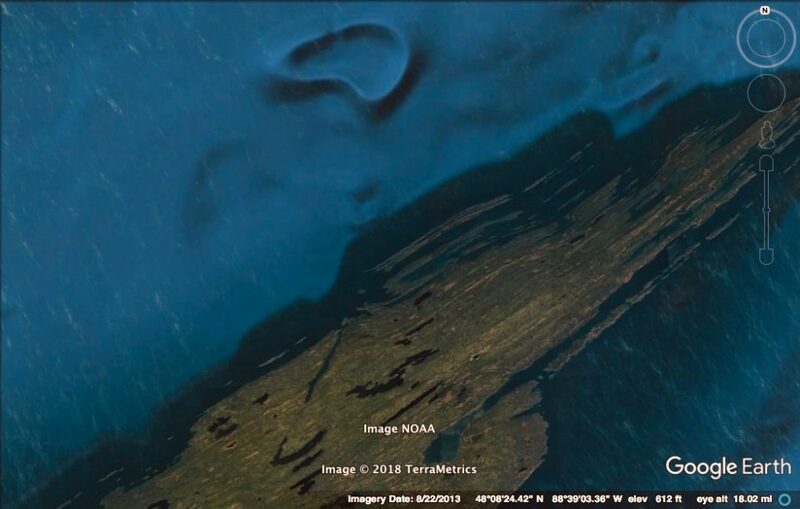 Using Google Earth to obtain an aerial view of the island’s ancient McCargo Cove, something truly out of place was observed beneath the water. Not only was the structure enormous, but it surely did not fit in with surrounding geological features. Since this discovery over five years have been spent trying to dig up information on this unusual structure. 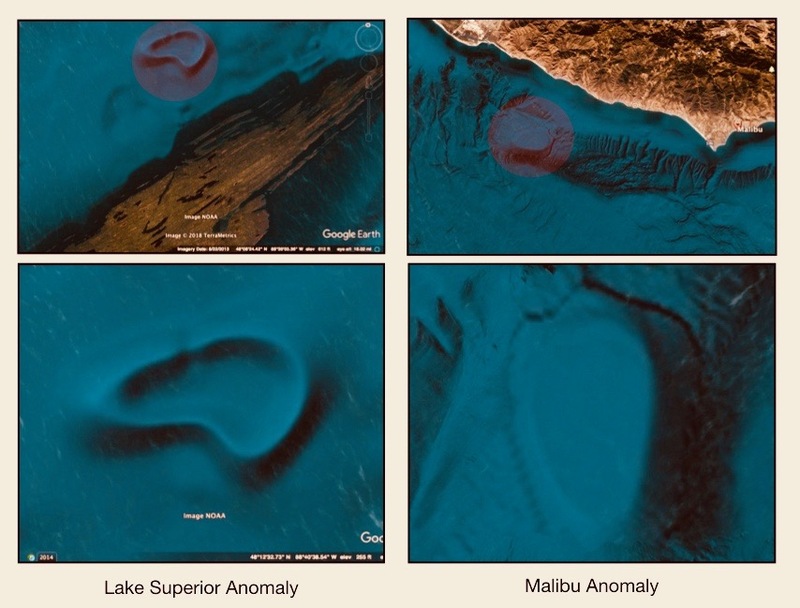 Currently no information what so ever has emerged in respect to the anomaly; nothing on the internet, nothing in the geological texts and experts are left stumped. Over the years the possibilities of the structures origins have been discussed and debated with friends and professionals. In this article we will speculate on a few of the possibilities suggested. A brief description may be in order before diving into the origins of the underwater structure. 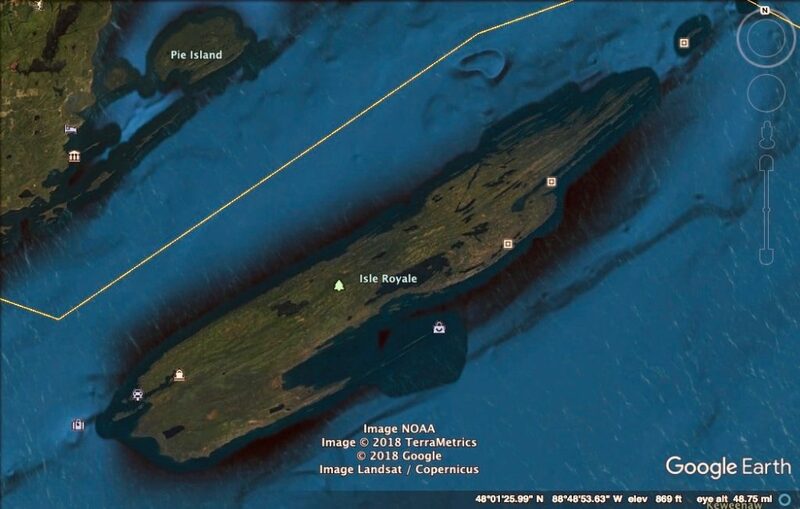 The Anomaly is located approximately four miles north of Isle Royal’s northern rocky shores, and a half mile south of the U.S./Canadian border. 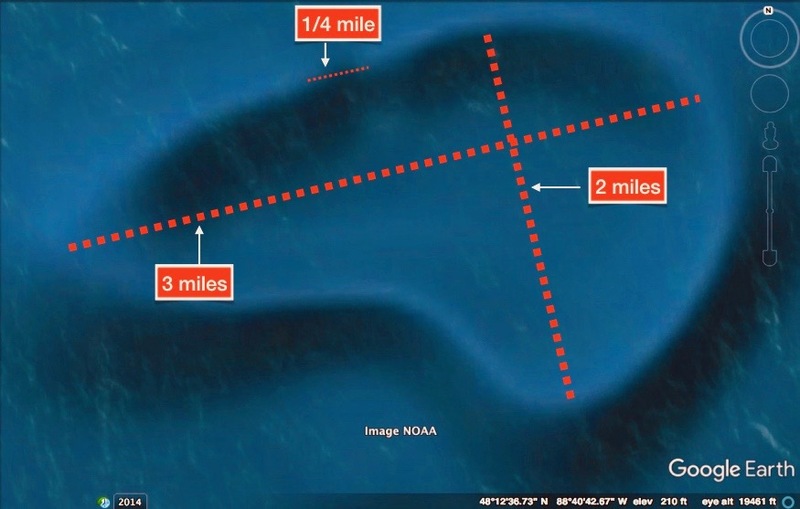 According to Lake Superior bathymetric maps the feature appears to be submerged in approximately 500 ft. of water. From above the structure appears as an oblong circle with a slight indentation on its SW side. The width of the feature is approximately 2 miles, while the length at its largest point is a staggering 3 miles. The anomaly appears to have an opening on its NW side that is approximately 1/4 mile across. A very peculiar aspect to the structure is what appears to be a unified height and width to the perceived walls. After studying the bathymetric charts it is approximated the walls may be around 250 ft in height. Now armed with some general information on the anomaly a thorough investigation into its origins is in order. The first possibility is that of a cometary or meteoric impact. This scenario has been the most suggested by those who the discovery has been shared with. 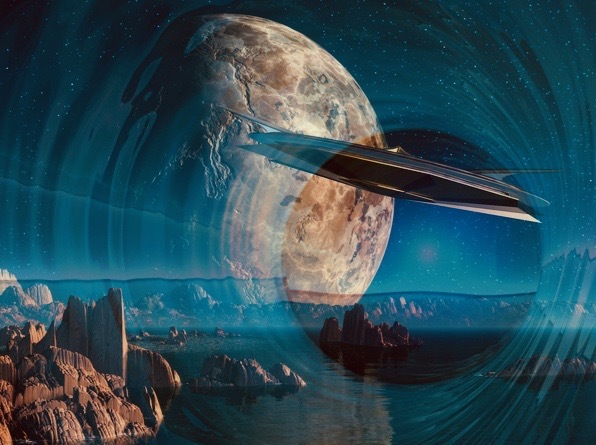 Could this cosmic and cataclysmic scenario be a possibility? Approximately 12,800 years ago this area of Michigan was emerging from the ice age. Temperatures were warming, and the miles thick Laurentide ice sheet were receding. Suddenly without warning, the warming trend was reversed and the region was once again slammed with a cold spell that would last until around 11,600 years ago. 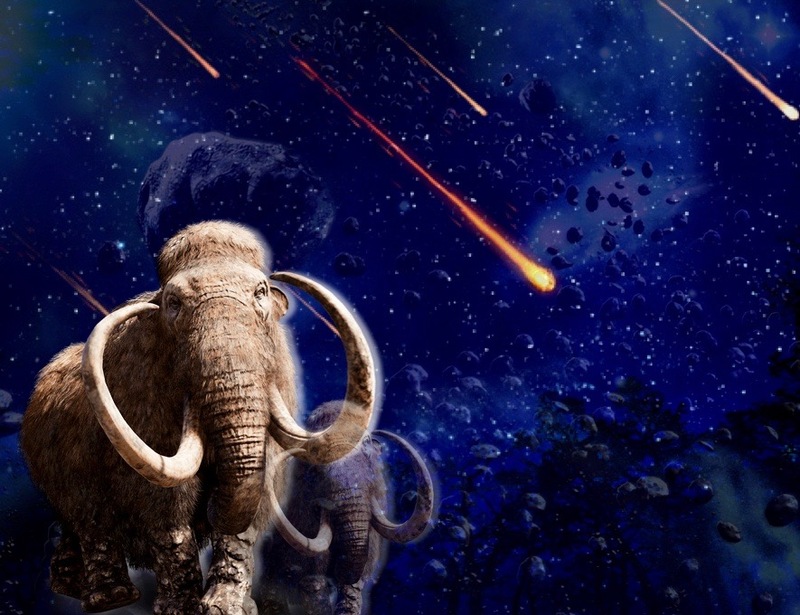 This era is referred to as the Younger Dryas by scientists. Until recently scientists thought the reversal from a steady warming to a sudden cooling was caused by enormous amounts of melt water from the glaciers. The theory postulated large amounts of fresh water spilling into the Atlantic Ocean may have caused shutting down of the oceans natural conveyer belts. The shutting down of the circulating belts was believed to have slammed the northern regions back into a 1200 – 1300 year cold spell. Over the past few decades a new theory has emerged. Scientific evidence has been accumulated pointing to a likely possibility of a cometary or meteoric impact ushering in the almost instantaneous cold snap. The evidence has pointed to the possible impact or explosion taking place over the Laurentide ice sheeting the precise area we are investigating. The piece of the puzzle scientists admit they are missing is an impact crater. They speculate that the cosmic intruder may have exploded over the ice sheet, therefore leaving no evidence. The second possibility that has been suggested relates to volcanism and Michigan’s fiery past! 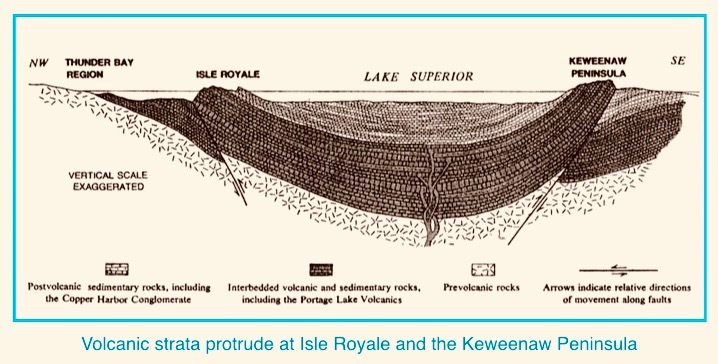 The region surrounding Isle Royale and the Keweenaw Peninsula was at one time possibly the most volcanic and unstable region on the planet. After settling down for a period of time , the activity once again peaked around 1.1 billion years ago. During this era the mid continental rift was formed, splitting apart in the precise region we are discussing. 1 For a distance of around 3000 km. the earth split apart in a arced formation that just so happens to be centered over Isle Royale and the Keweenaw Peninsula. During this time massive amounts of lava poured from the earth’s crust. The third possibility is that of an ancient mega mound site. 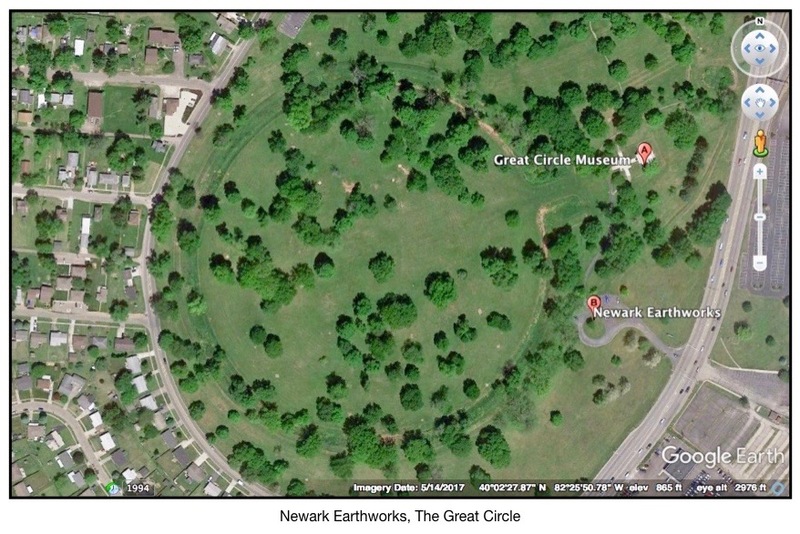 The main reason for this suggestion is surely due to the features similar shape and form when compared to ancient Native American earthworks. Not only are the earthen walls similar, but the perceivable opening correlates with many Native American mounds from the vicinity. 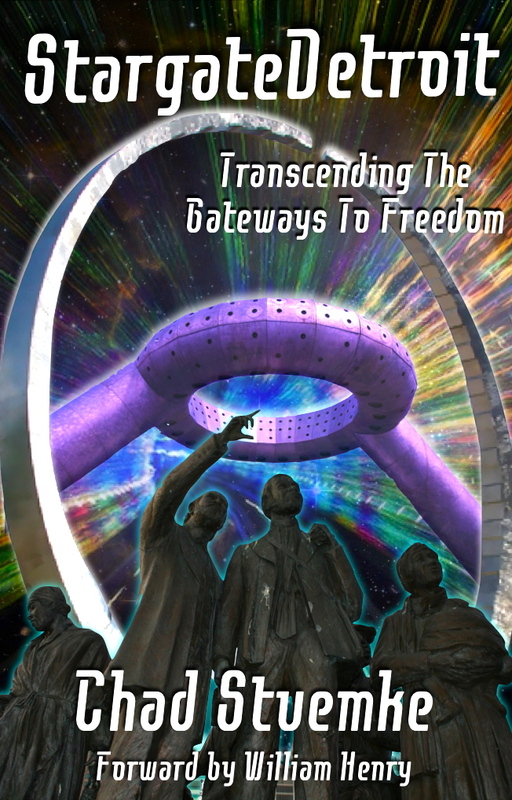 The openings were many times aligned to astronomical events. 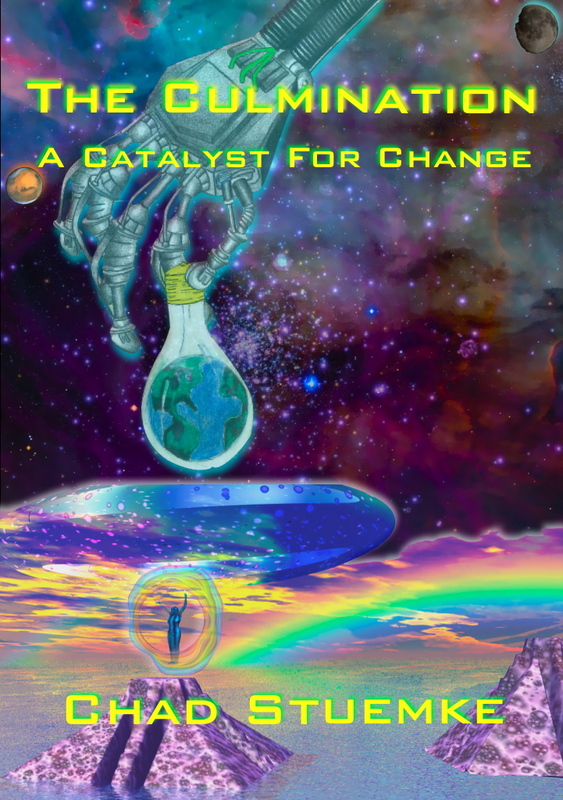 The fourth scenario involves the mythological ancient Atlanteans and the possible mining of copper. Isle Royale and the Keweenaw Peninsula contain some of the largest and purest copper deposits in the world. Is it possible this structure is a leftover remnant of an ancient harbor or mining operation? It should be pointed out, there were times in recent geologic history in which this structure and landmass would not have been submerged. 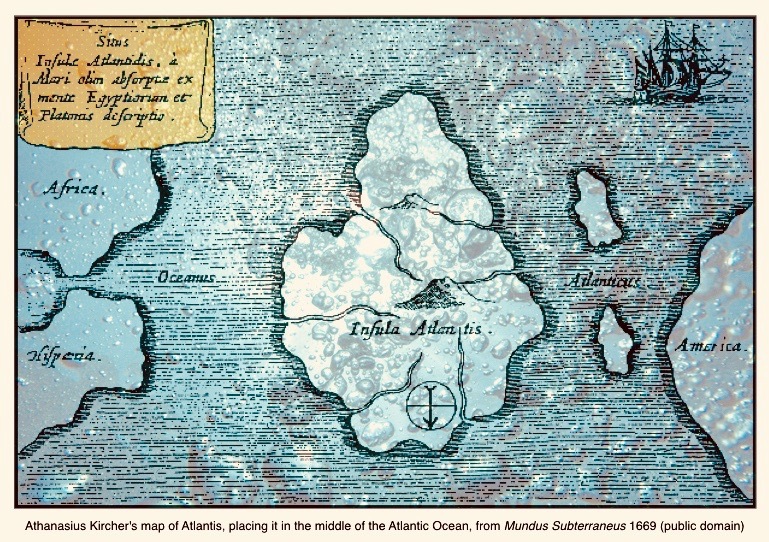 In regards to a possible Atlantean connection….. Several ancient writings, including Plato’s Atlantis, mention a sacred metal called Orichalcum. It is believed the Orichalcum alloy primarily consisted of copper mixed with several other minerals in lesser amounts. In the Critias Plato describes the Atlantean Temple to Poseidon and Cleito as being adorned and covered with Orichalcum. The shiny metal was said to have covered floors, walls, and even pillars. 2 One special pillar, coated in Orichalcum, was said to be inscribed with the laws of Poseidon. 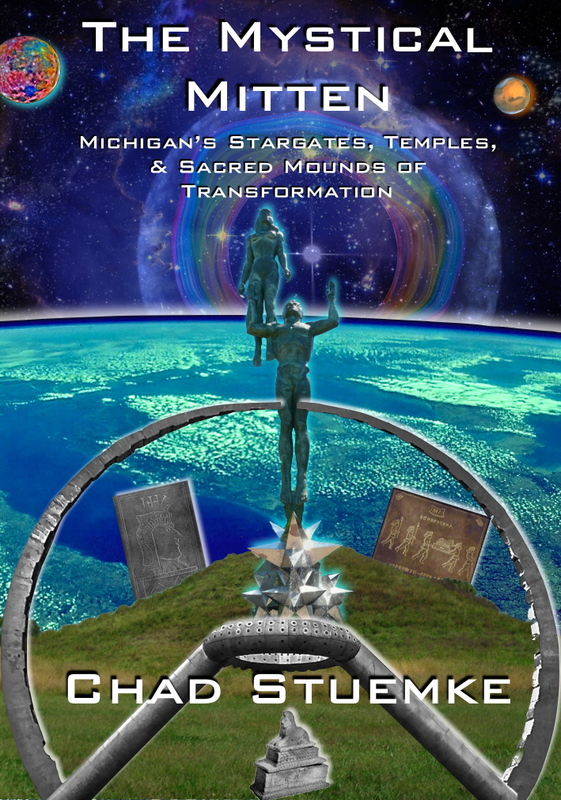 Is it possible that in an ancient time, a super culture ventured to northern Michigan to mine one of the most treasured minerals in the world. And if so, could this anomalous feature be a leftover remnant of the era? 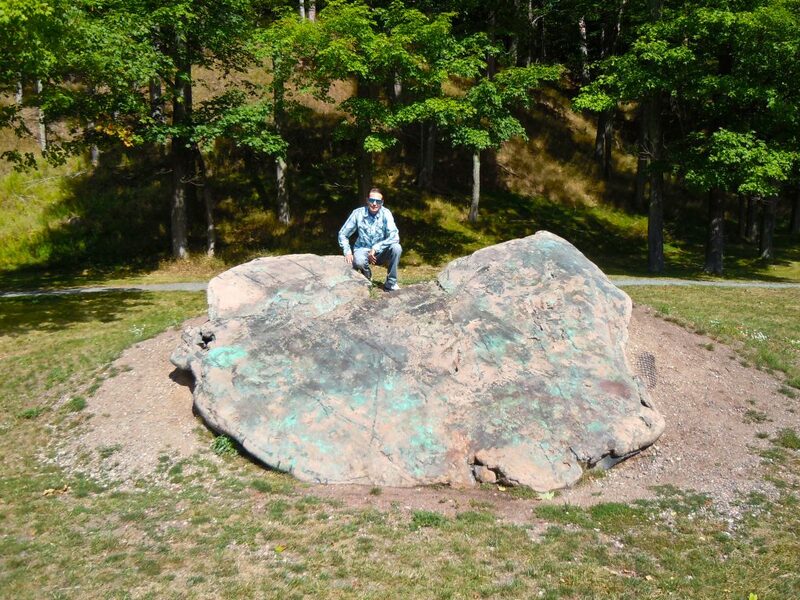 Something to ponder…..
Worlds largest piece of glacial copper from the vicinity! 28.2 tons! 9000 lb. mass of copper from the area! 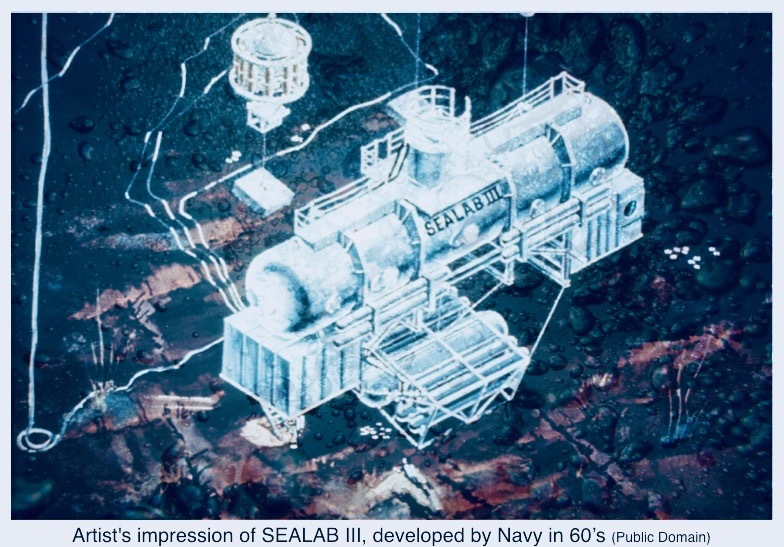 A fifth possibility that has been suggested is that of an underwater government base. Although this may seem unlikely, underwater bases make sense in more ways than one. Of course they would be hard to detect and even more difficult to infiltrate. Is it possible there could be an underwater base, submarines and all submerged in the depths of Lake Superior? Surely over the years the military-industrial complex has secretly developed a new generation of technology they would wish to keep secretly hidden. It has been pointed out, “Some objects witnesses have seen coming and going from the watery depths may be a new generation of technology secretly developed and funded, and deployed from secret facilities and installations, some of which may be highly clandestine facilities submerged beneath bodies of water.” 4 That being said, while some speculate on governmental and terrestrial technologies being developed, others have postulated a slightly more far out scenario. 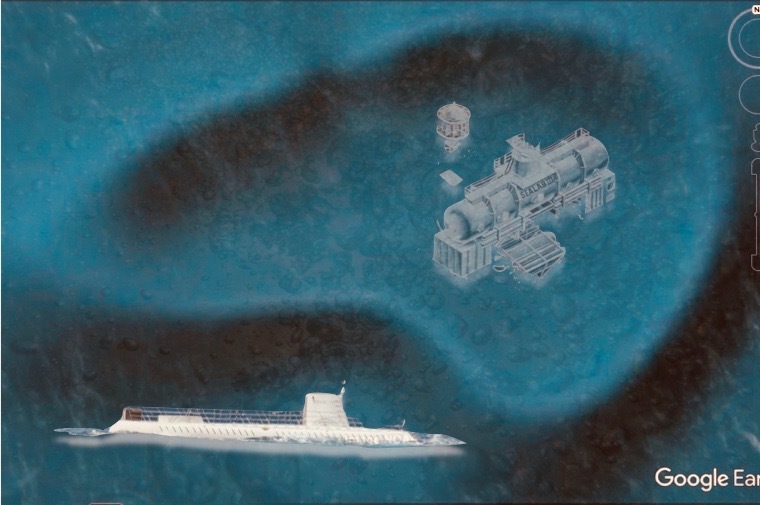 The Sixth and admittedly most far out scenario has been the suggestion of an underwater extraterrestrial base. Coincidently (or not) Lake Superior has been considered a hot spot for u.f.o.’s and u.s.o’s (underwater submersible objects) for decades! An extensive land and water search found not a trace of either craft nor the two pilots of the interceptor. Granted this is an incredible story, yet many stories of a similar nature have come to light in the same general vicinity! 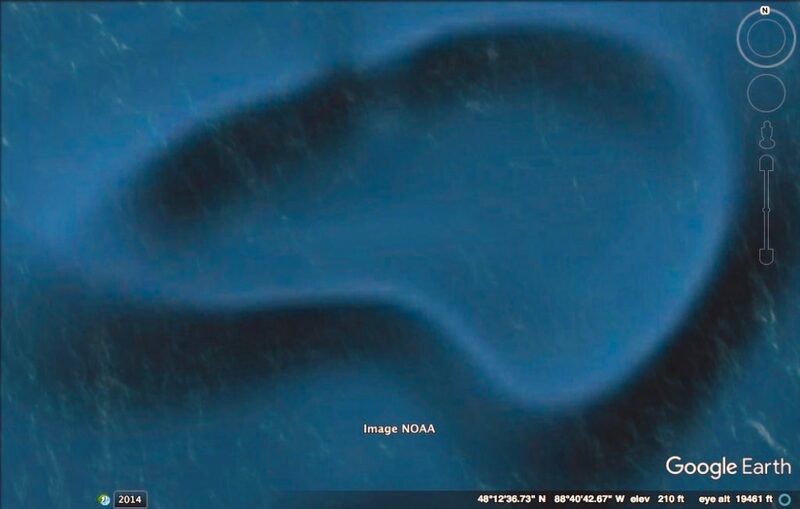 One last coincidence in this regard is the discovery a few years ago of what some have claimed to be an underwater u.s.o. base off the coast of Malibu. Although the shape and size are quite different, many of the stories and legends surrounding the area are quite similar. Is it conceivable that this anomaly is actually an extraterrestrial base of sorts? Possible? 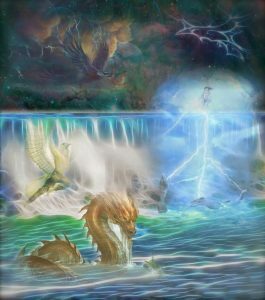 Thus far several options and possibilities have been presented in regards to the origins of the mysterious underwater anomaly. Surely there are other possibilities, yet these scenarios have been the most consistently suggested up until this point. Hopes are that by revealing this structure, and its possible origins, we can bring awareness to a mystery that has been submerged for thousands of years!